Sephora has always been all about making beauty convenient and accessible. So their latest venture should come as no surprise: Vending Machines! When I think of vending machines I immediately think of all the loose change I have lying around at home (and not with me when needed) and huff in frustration that if I had just one more quarter I could nab that trail mix I've been craving all morning. Ok, you caught me, it's not trail mix, it's TGIF Bacon and Cheddar Chips and yes I have a hankering for them at ten in the morning! The Sephora Vending Machines, however, feature makeup, skincare and fragrance items from some of the beauty mecca's most popular brands such as Dior Beauty, Bare Escentuals, Smashbox, Philosophy, Murad, Peter Thomas Roth, Korres, Juicy Couture, and StriVectin. The mini makeup counters are featured, past security, in several airports across the country (BNA in Nashville, TN; LAS in Las Vegas, NV; IND in Indianapolis, IN; DFW in Dallas, TX; JFK in Queens, NY; or IAH in Houston, TX). Those know-it-alls know how vulnerable we are lollygagging about by our gate, waiting around (sometimes endlessly) for flights! It's the perfect place to purchase any of the topical treats you might have forgotten en route to Land That Is Not Your Home. If you are in a rush, they're quick and easy to use with touchscreen menus that divulge pertinent product info and pricing. Plus no need to scrounge for change or crisp dollar bills as your plastic of choice is readily accepted. Although, I really do protest that vending machines don't take pennies. Is there a petition sheet I can sign up for to reverse this annoying ruling? Tangent, I apologize. Look for the beauty boxes at some of your local malls or JCPenny stores (especially the ones without a full service Sephora counter). This is so exciting; I can't wait for them to pop up everywhere, perhaps even replacing the vending machines at work. That way I'd look fabulous every morning and not be so tempted by TGIF's chip offerings! 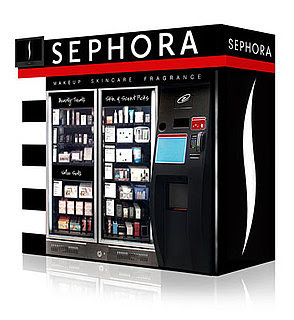 Let me know if you've seen a Sephora Vending Machine at an airport or mall recently. Follow Sephora (@Sephora) on Twitter! You can follow them right after you've started following me (@beautybuffblog)!